I have been having a nice week, but I am looking forward to the weekend. My husband and I have a lot of plans including seeing Jack O'Lanterns, rewatching Pacific Rim, and going to a Halloween party. I am looking forward to all of the fun that we are going to have! I feel like I have failed you. The scarf is still incomplete. There is so little yarn left; however, it doesn't seem to end. 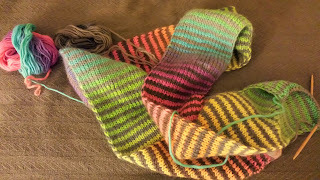 Every time I watch television, I dutifully pull out the scarf to work on, but it never ends. It never ends. :( This will be my last scarf for a little while. 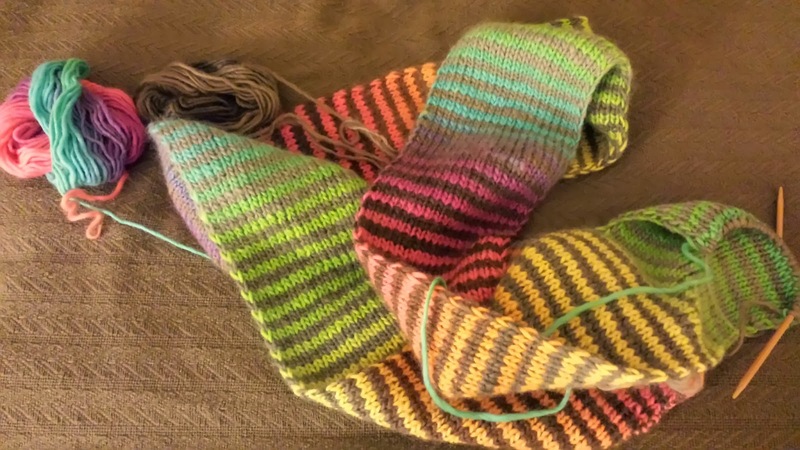 Instead of knitting television, I need to share this post by the Yarn Harlot. She needed one ball of yarn to finish a baby blanket, and she got it through the love of the Internet. It will make your afternoon.